Famous people born on OCTOBER 11 are Libra who are best matched with another Libra. What better combination than two people who are mirrors of each other! But they must stay away from Virgos. There’s just something about them… they are attracted to each other but it never works out. There’s no balance to be had among these two zodiac signs. Famous October 11 celebrities want their freedom, their space and their time to be theirs. They make the rules. That’s how they like it and that’s how it’s going to be. Now when it comes to work, they apply the same principles. In order for them be at their best, they must have some form of individuality and control. Usually, a person who feels this way will likely work for themselves. They could be one of those people. Depending on their ideal of what floor or level success is on, they will do well. They don’t let the money or status go to their head. However, they live a comfortable lifestyle. 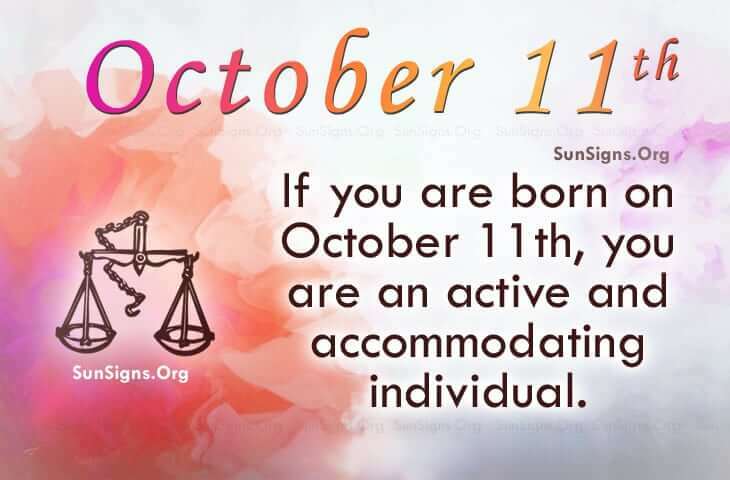 Famous people born on OCTOBER 11th are likely to be active individuals who will walk away from confrontations. Additionally, they will tell a little white lie to avoid hurting someone’s feelings. If they eat right, they will feel better.